Ron McKeown endured more than his share of heartache as a Collingwood footballer, including his controversial omission from the last two finals of Collingwood’s fabled 1990 triumph. But the powerfully-built Magpie, who was equally adept at both ends of the ground, deserves to be remembered as much more than one of the club’s hard-luck stories or an answer to a trivia question about who missed out on a drought-breaking premiership. McKeown’s 123 games across 10 senior seasons should be judged for what they were – a strong contribution to a football club that didn’t always afford him the sort of respect he gave it. He was often the player who would make way for others when a bad loss came, and on several occasions was touted for possible trade, while maintaining himself that he could never play against the club that gave him his chance to play league football. As a defender, the 188cm, 96kg McKeown was well suited to one-on-one battles, in an age when defenders had to take on the might of some of the game’s greatest forwards in Tony Lockett and Jason Dunstall. As a forward, he was capable of providing a target in attack, and was a prodigious kick with a fine sense of judgement and a good set of hands. McKeown first came under notice from Collingwood as a teenager playing with Macleod, in the Magpies’ natural catchment area of the northern suburbs. He grew up as an Essendon supporter; his favourite player being Ron Andrews, not knowing that he would later play one season with him – albeit in a black and white jumper. He excelled almost from the time he came to Collingwood, winning the club’s under 19s best-and-fairest award in 1983, and a year later was a member of the Australian schoolboys’ team which toured Ireland. Such was his impact that he was selected to debut for the Magpies as a 17-year-old, against Carlton, at Waverley, in Round 15, 1984. Wearing No.25, he played in defence in that first game, against Paul Meldrum. He ended up playing six games that season – including two finals, a semi-final win over Carlton, and a preliminary final thrashing at the hands of the team he supported as a kid, Essendon. McKeown booted 10 goals from 15 games in his second season in 1985, and 24 from 17 games in 1986. As a 19-year-old, he kicked 8.1 from half-forward in Collingwood’s dismantling of reigning premiers Essendon in Round 12, 1986, at Waverley. But a series of career-interruptions cut into his effectiveness, most tellingly with stress fractures in his foot which kept him on the sidelines. He managed only four games in 1987, and eight in 1988. McKeown had been dropped from the senior team on the eve of the 1988 finals series, but fought his way back into the side for the semi-final against Melbourne. He kicked two goals in the Magpies’ loss to the Demons, but almost didn’t play that day as his grandfather had died only hours beforehand. “I was very upset when my grandfather died, I thought about pulling out of the game,” he recalled. He had been in tears when arriving at the ground, but played the match as a tribute and ended up being one of the club’s best performers. 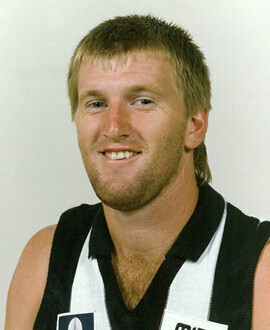 McKeown was overlooked in the early rounds of 1989, but recalled to play on Lockett in Round 4, and kept the star Saint to only five goals. Later that season he was beaten by Dunstall and shifted forward, where he kicked 5.0 in a team that lost by 10 goals. He played 14 games in 1989, alternating between defence and attack, but Matthews was emphatic when asked McKeown’s best position: “Full back”. That’s where he played for much of 1990 – the year he considered was his best and most consistent season. Now wearing No.5, he played 20 games – his most in any season – but fell out of favour at the wrong time. To McKeown’s credit, he accepted the decision – even if he didn’t agree with it – and never publicly criticised Matthews for the shock omission, even when he had to watch Collingwood go on to win its first premiership in 32 years a fortnight later. A letter sent to him from Hawthorn’s Peter Schwab, who had missed the 1989 Grand Final due to suspension, convinced McKeown to stay at Collingwood. He kicked five goals in the opening round of 1991, just a week after he and his wife endured the personal tragedy of losing their prematurely born twins. Soon after, he took some time away from the game to mourn, unsure if he would return. But his love of the club enticed him back: “I missed playing and it seemed strange after eight years with the club.” That return saw him pass the 100-game milestone, as he continued to play good football in defence. But the recruitment of Gary Pert for the 1992 season cost him the full-back role. He was shifted forward, and kicked 29 goals from 13 games in 1992, including 5.1 in an elimination final loss to St Kilda. He would play one final season for Collingwood in 1993, taking his final tally to 123 games and 105 goals before announcing his retirement. McKeown contemplated a comeback in late 1995 when Tony Shaw took over as coach, but opted against it, instead playing on at local level before becoming football operations manager at the Northern Football League. He and his wife Jo had three more children, including son Ned, who spent time on Collingwood’s VFL development list.